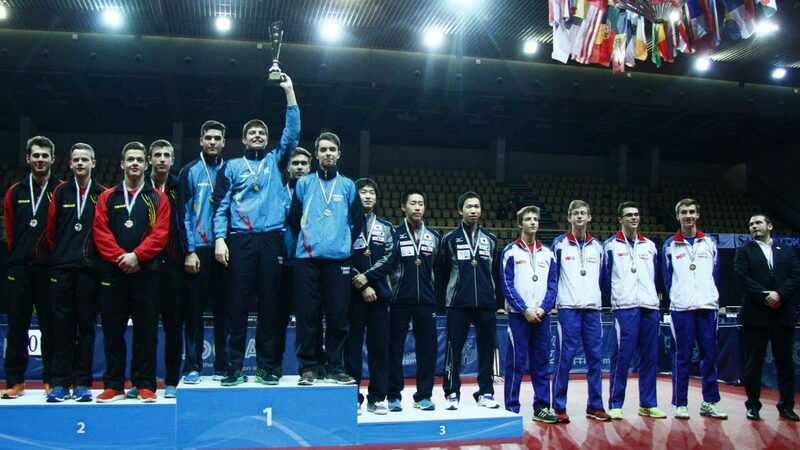 Winner earlier in the year on the ITTF World Junior Circuit in Bahrain, on Saturday 5th November, Alexandru Manhole emerged as the hero of the hour in Szombathely, as against expectations Romania, the no.5 seeds, clinched the Junior Boys’ Team title at the 2016 Hungarian Junior and Cadet Open. However, it was not the best start to the day for the 18 year old. He was the one player to suffer defeat as alongside colleagues, Rares Sipos and Florin Spelbus, a three-one success was recorded against the no.3 seeds, the Russian outfit formed by Artur Abusev, Denis Ivonin and Lev Katsman. In the second match of the fixture, he was beaten by Denis Ivonin by the very narrowest of margins (9-11, 11-7, 11-7, 11-13, 11-9). Win a close match, you gain confidence and you progress from strength to strength is a well-worn theory; for Alexandru Manole it would seem the concept was lose a close match and you progress from strength to strength. At the semi-final stage against Japan, the top seeds, he beat Masaki Takami in the opening contest (11-9, 14-12, 11-5), before in the fifth and deciding match overcoming Takuto Izumo (11-3, 11-9, 11-6) to secure the victory. The one further win for Romania was recorded in the second match of the fixture when Rares Sipos overcame Takuto Izumo (5-11, 11-7, 11-2, 11-13, 11-9); for Japan, the successes came in the third and fourth matches of the fixture as a recovery appeared on the cards. Koyo Kamamitsu beat Florin Spelbus (9-11, 11-9, 11-13, 11-3, 13-11), before Masaki Takami levelled matters by overcoming Rares Sipos in yet another duel decided by the minimal two point margin in the deciding game (3-11, 5-11, 11-8, 11-9, 12-10). A place in the final booked, against Belgium, the no.4 seeds, it was very much the same scenario. The Romanians thwarted a revival. Rares Sipos beat Laurens Devos (11-9, 11-8, 13-11), before Alexandru Manole overcame Florian Cnudde (11-9, 11-7, 11-5). It was at that stage the recovery began; Thibaut Darcis accounted Florin Spelbus (4-11, 11-8, 8-11, 11-5, 11-5), Florian Cnudde overcame Rares Sipos (9-11, 9-11, 11-3, 12-10, 11-6). The destiny of the title lay in the hands of Alexandru Manole and Laurens Devos; the Romanian was a man with a mission. He won in three straight games (11-3, 11-2, 11-8); the title was secured. Disappointment for Laurens Devos but at the semi-final stage he had been the Belgian hero in the three-two win against France, the no.2 seeds. He beat Leo de Nodrest in the second match of the fixture (11-9, 11-8, 9-11, 11-8), before in the decisive fifth match of the contest defeating Irvin Bertrand by the very narrowest of margins (8-11, 11-8, 7-11, 11-9, 12-10). 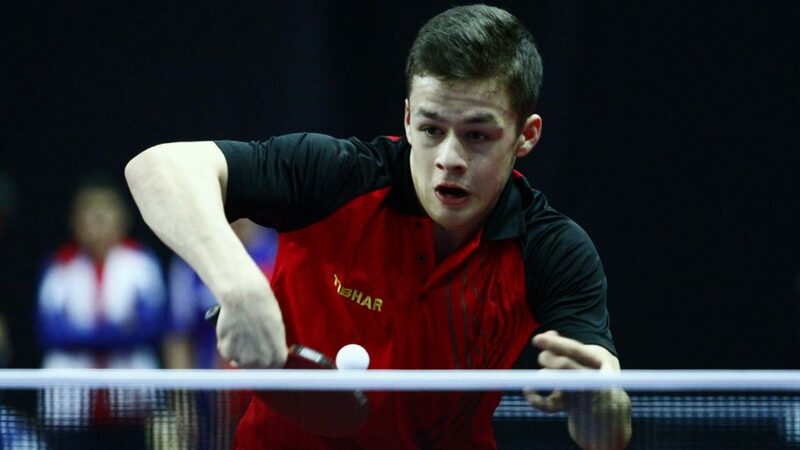 Earlier at the quarter-final stage, the Belgian trio had beaten the no.9 seeded outfit comprising Moldova’s Andrei Putuntica who lined up alongside Egypt’s Youssef Abdel-Aziz and Abdelrahman Rahmou by three matches to one. Play concludes on Sunday 6th November with the individual events in the cadet age group category.